God's Other Creatures are our Animal Friends. (Rabbit, Eastern Cottontail (Sylvilagus floridanus) - 01) We spotted this rabbit while we were taking one of our walks, and he or she was kind enough to allow us to take a few pictures. 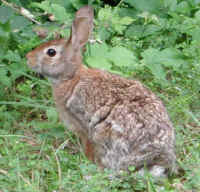 We believe that this rabbit and the following photos are Eastern cottontail rabbits, because they lack the black fir on the anterior portion of the ear that the almost identical New England cottontail rabbit has. (Rabbit, Eastern Cottontail (Sylvilagus floridanus) - 02) We kept moving slowly as we took these photos, and friend rabbit kept watching us, but did not run away. 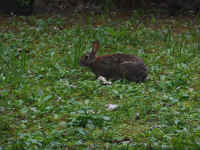 (Rabbit, Eastern Cottontail (Sylvilagus floridanus) - 03) And we continued to watch each other for a few more minutes. 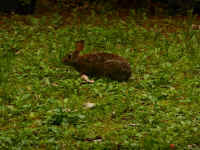 (Rabbit, Eastern Cottontail (Sylvilagus floridanus) - 04) As we watched this rabbit, we continued taking more pictures. (Rabbit, Eastern Cottontail (Sylvilagus floridanus) - 05) As we continued walking slowly along the road, the rabbit turned around and started hopping in the same direction we were going. (Rabbit, Eastern Cottontail (Sylvilagus floridanus) - 06) Every time we have a close encounter with one of God's other creatures, as we had with this rabbit, it reminds us of how wrong it is to kill an animal for pleasure, and how right it is to enjoy each other's company in peace. 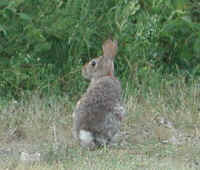 (Rabbit, Eastern Cottontail (Sylvilagus floridanus) - 07) We thanked friend rabbit for allowing us to take these photos, and slowly continued down the road. 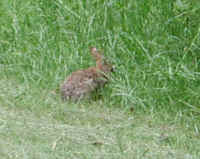 (Rabbit, Eastern Cottontail (Sylvilagus floridanus) - 08) On another walk, we spotted this rabbit eating some grass or clover. (Rabbit, Eastern Cottontail (Sylvilagus floridanus) - 09) The rabbit looked up at us for a brief moment, and sensing no danger from us, continued to eat. 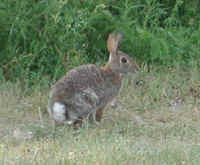 (Rabbit, Eastern Cottontail (Sylvilagus floridanus) - 11) During a late afternoon walk on 28 June 2003, we saw this rabbit dining on some veggies along the side of the road. (Rabbit, Eastern Cottontail (Sylvilagus floridanus) - 12) As we slowly walked a little closer, we took another photo of this rabbit. (Rabbit, Eastern Cottontail (Sylvilagus floridanus) - 13) Then the rabbit took a few hops and stopped to allow us to get quite close in order to take this photo, for which we thanked him or her. (This photo was taken with our normal, non-telephoto lens.) We have a theory that the reason we are able to get so close to wild animals is that, being vegetarians (vegans), we don't smell like meat-eaters, and thus they sense no real threat. 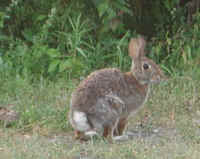 (Rabbit, Eastern Cottontail (Sylvilagus floridanus) - 14) Friend rabbit was on the side of the road, as we were taking a morning walk (21 July 2003). He or she saw us coming and hopped a few steps away, but then stopped and allowed us to approach within a few feet of him or her, and patiently waited while we took this picture. 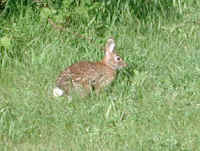 (Rabbit, Eastern Cottontail (Sylvilagus floridanus) - 15) On 30 March 2004 Debra Stitt sent us this photo with the following comment: "I was feeling a little stressed this morning...I was trying to get motivated for my morning workout, which was difficult under the circumstances! I had just picked up my weights and saw something out of the corner of my eye. 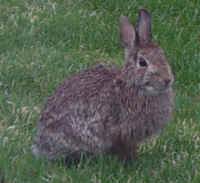 Low and behold this perfect little bunny appeared out of nowhere and was sitting right outside of my window looking right at me. She sat there watching me until I had finished my set and then lingered even longer allowing me to take four pictures of her. 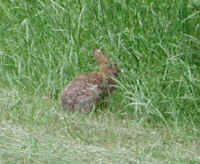 She then scampered off into the bushes. It's almost as if God sent her to give me a different perspective on the day. The timing was perfect -- just like her! Blessings come in all shapes and sizes! (Rabbit, Eastern Cottontail (Sylvilagus floridanus) - 16) On 30 June 2017 we saw this rabbit having breakfast on the side of our neighbor's driveway. (Rabbit, Eastern Cottontail (Sylvilagus floridanus) - 16a) This is a closer look at our friend rabbit. We're not sure what was on the breakfast menu, but we do know that if we were all vegan like this rabbit, we would not cause billions of other animals to suffer and die every year. 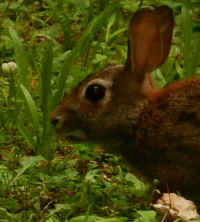 (Rabbit, Eastern Cottontail (Sylvilagus floridanus) - 17) This is another look at our friend rabbit. (Rabbit, Eastern Cottontail (Sylvilagus floridanus) - 18) After we took this photo, we went on our way, and let the rabbit finish breakfast.